Fire extinguishers are one the best defenses you have in the event of a fire in your home or workplace. If used properly, on the right type of fire, they can prevent the spread of flames, and reduce the damage caused by some and fire. They might even save your life. Did you know that fire extinguishers have limits? They are intended for us on small, contained fires. A fire can quickly spread and get out of control, so call 911 right away, even if you think you can put the fire out. 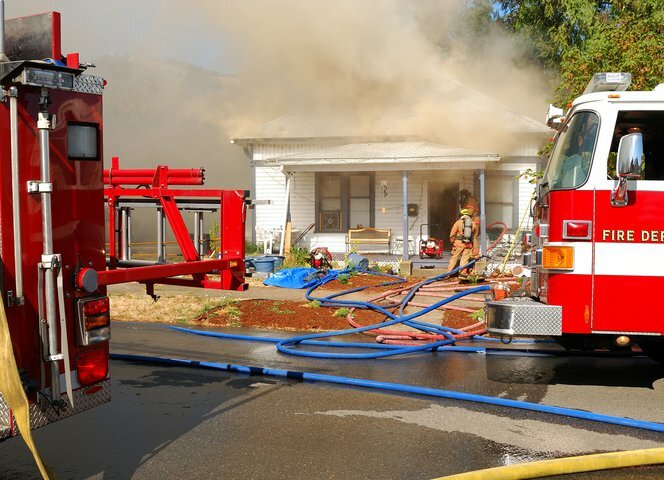 Make sure when you are trying to put out a fire that you do so with your back to an unobstructed exit, and if the room is filling with smoke, or the flames are taller than you are, get out! Having a fire escape plan is always a good idea. Fire extinguishers can prevent a small fire from becoming a large fire. It’s important to be familiar with the different types of extinguishers so you know which one to use, and when to use it. Fire extinguishers can be classified as type A, B, C, D or some combination of these letters. Class A fire extinguishers are used to put out fires that started with solid organic materials like wood, paper, or cardboard. Class B fire extinguishers are used to put out fires linked to flammable liquids or gases like kerosene or gasoline. Class C fire extinguishers are used to put out electrical fires. Class D fire extinguishers are rarely used in homes or office environments because it is used to put out fires caused by combustible metals. Class K fire extinguishers are generally only seen in commercial kitchens and are used to put out serious grease fires. 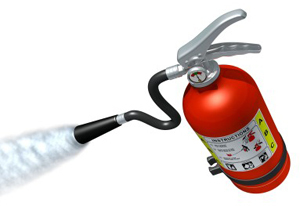 Most experts recommend purchasing multipurpose class A/B/C fire extinguishers for home use. Class A/B/C extinguishers use monoammonium phosphate which can be used to extinguish paper/wood fires, flammable liquid fires, and electrical fires. Buy the largest one you can comfortably handle and keep it fully charged and pressurized. There should be at least one fire extinguisher on each level of your home. They should be kept out of reach of children, but easily accessible for adults. Keep them where a fire is most likely to start and near an exit. The kitchen and the garage are common starting places for house fires. You should also keep a fire extinguisher in the room if you have wood burning fireplace. So now that you know what types of fire extinguishers to use and where to store them you need to know how to use the. Did you know that according to FEMA, most Americans don’t know how to use a fire extinguisher? Squeeze the trigger carefully. The contents are under pressure so squeeze with control. Sweep the flames out. Continue aiming at the base of the fire and use a sweeping back and forth motion to extinguish the fire. Always remember to keep an eye on the origin of the fire while you wait for the fire department to arrive. Fires can be tricky and even if they appear to be out they can re-ignite easily. Once you have used your fire extinguisher make sure you recharge and re-pressurize it right away; or if it is disposable replace it with a new one. If you experience a fire in your home or office call Emergency Restoration Experts today! We can help with the cleanup any time day or night. We know how traumatizing a fire can be and that you just want things to get back to normal.